Vermont Sen. Bernie Sanders (I.) was the least bipartisan member of the Senate during the 114th Congress from 2015 to 2016, according to a new report released Wednesday. The Lugar Center, a nonprofit public policy institution, and Georgetown University's McCourt School of Public Policy released a nonpartisan ranking of how each member of Congress worked together across party lines. The Bipartisan Index "measures the frequency with which a member co-sponsors a bill introduced by the opposite party and the frequency with which a member's own bills attract co-sponsors from the opposite party." According to the Senate Scores Index for the 114th Congress, Sanders ranked last. 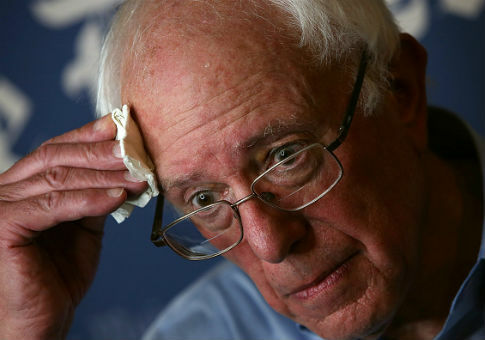 Sanders, a self-declared socialist, was joined at the bottom of the list by Democratic Sens. Barbara Boxer (Calif.), who was ranked no. 95; Jeff Merkley (Ore.), who was ranked no. 94; and Elizabeth Warren (Mass. ), who was ranked no. 88. Republican Sen. Susan Collins, (Maine) was ranked in first place, followed by Sens. Joe Donnelly (D., Ind.) and Rob Portman (R., Ohio). Sen. Ted Cruz came in at the second lowest score. Majority Leader Mitch McConnell (R., Ky.) and then-Minority Leader Harry Reid (D., Nev.) were excluded from the list. Current Minority Leader Chuck Schumer (D., N.Y.) came in at no. 72. In the House Scores Index, Rep. Maxine Waters (Calif.) ranked close to the bottom at no. 413. Right below her on the list was fellow California Democratic Rep. Barbara Lee. Republican Rep. Peter King (N.Y.), ranked first place for the House, while one of his GOP colleagues, Rep. Tim Huelskamp (Kan.), came in last. House Speakers John Boehner (R., Ohio) and Paul Ryan (R., Wis.) and Minority Leader Nancy Pelosi (D., Calif.) were excluded from the list. Majority Leader Kevin McCarthy (R., Calif) was ranked no. 58. This entry was posted in Politics and tagged Bernie Sanders, Congress, Elizabeth Warren, House of Representatives, Maxine Waters, Peter King, Senate, Susan Collins. Bookmark the permalink.